It’s been over five years since the first mountain bike trail opened in the Cleveland Metroparks, and the opponents’ predictions of world chaos have not come true. The first was a short 2.5-mile loop in the Ohio & Erie Canal Reservation. Then, in June of 2012, a 10-mile double-loop Royalview Trail was created in the Mill Stream Run Reservation in Strongsville. Just this past June, the Bedford Singletrack opened up in the Bedford Reservation. I’ve been enjoying the Bedford Singletrack since it opened, as it’s the closest mountain bike trail to where I live. It’s a short 15-to-20-minute drive, as opposed to the 45 minutes or more it takes to get to any other local trail. At about 6.5 miles from home, I had been thinking that it would be practical to ride my bike there, hit the singletrack, then ride home. This past Tuesday, I finally had the opportunity to do that. I headed out Ravenna Road from Twinsburg, which turns into Broadway Avenue at the Summit/Cuyahoga County line and the Village of Oakwood. A paved bike path runs next to Broadway through most of the village, which makes makes this part of the ride a little more stress-free. Then, I proceeded up Broadway into the city of Bedford, and made a left onto Union Street, which intersects the paved All-Purpose Trail that runs through the Metroparks. Making a left on the APT leads you to the Egbert Picnic Shelter in the Bedford Reservation, which also serves as the main trailhead for the Bedford Singletrack. I arrived in just a little over 30 minutes. 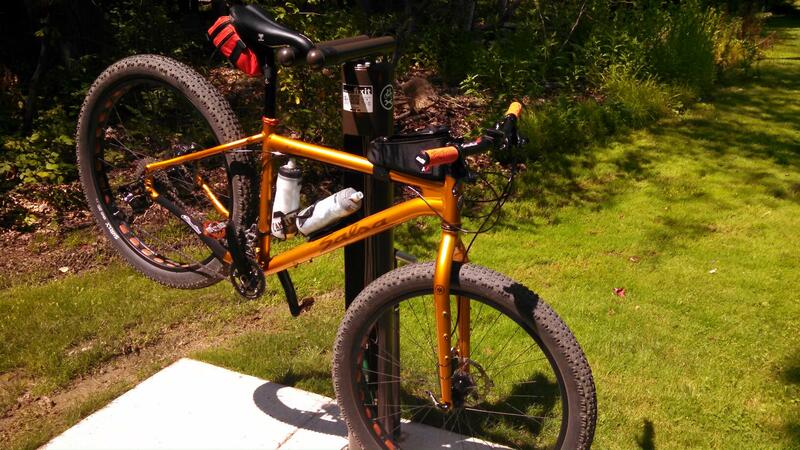 I topped off my water bottle at the drinking fountain provided near the picnic shelter, and headed a bit further down the APT towards the singletrack. I stopped to let some air out of my tires to go from the higher pavement-level pressure down to the appropriate dirt-level pressure. The Bedford Singletrack consists of about 10 sections of off-road trail, connected by brief sections of the All-Purpose Trail, for a total of about 10.5 miles. The singletrack is intended for mountain biking and hiking only, with mountain biking in the (roughly) clockwise direction, and hiking in the opposite direction. It also crosses the equestrian trail a few times, and runs concurrent with the equestrian trail for a short stretch. The trail is marked with white arrows or blazes of white paint on trees. 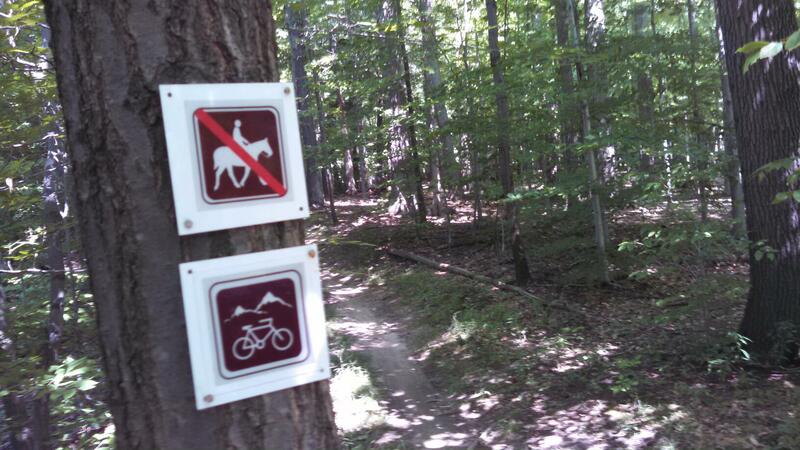 The Metroparks also provided signs to indicate the proper direction for bikers and hikers. 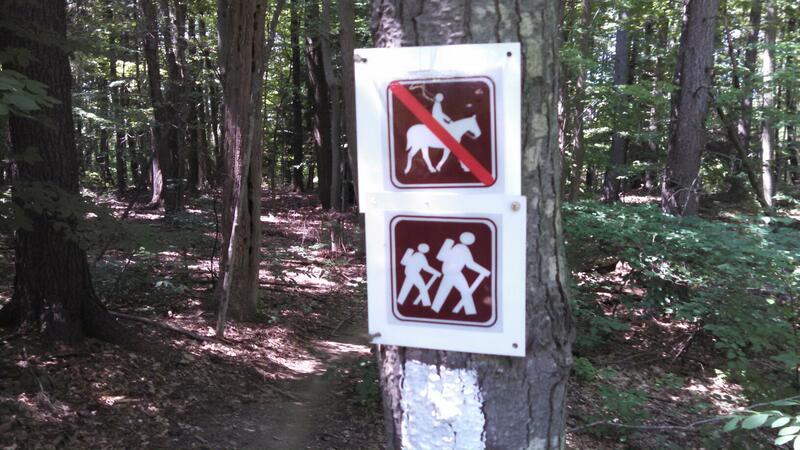 Originally, the signs used the classic “red slash” (“NO!”) signs for bikers and hikers. So, if you were hiking and saw a sign indicating “No Hikers,” that meant that you were just hiking in the wrong direction. If you were mountain biking and saw a sign indicating “No Bikers,” that could have meant that you were on the correct trail but going in the wrong direction, but it also could have meant that you were on a bikes-prohibited trail (e.g. the equestrian trail). This trip, I noticed that some of these signs were replaced with the symbol to indicate the preferred activity on the trail in the direction you are headed, instead of the red slash signs. Numerous psychological studies have shown that people respond better to positive reinforcement rather than negative reinforcement. I’m glad to see that the Cleveland Metroparks have finally realized this, and that they are taking this additional (although small) step away from being the organization of “NO” and towards being the organization of “Yes.” They still use the red slash signs to indicate that horses are not permitted on the singletrack trail, and to indicate that bikes are not permitted on most areas of the equestrian trail, which is understandable and I agree with. 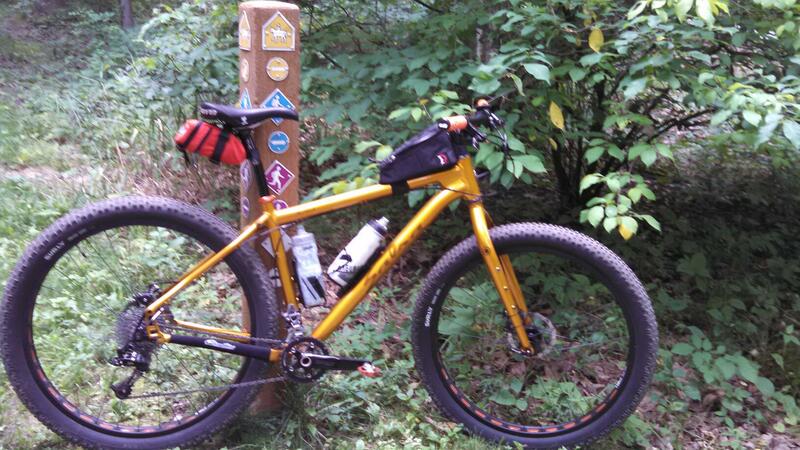 I rode the Bedford Singletrack for two complete loops, then headed back towards home. Before I left the Egbert Picnic Shelter, re-filled my water bottle again, and took advantage of the bike-fix-it station provided there to pump my tires back up to pavement pressure. I carry a mini-pump with me in case of a flat tire, but having the full-size pump here made this a lot easier. The fix-it station also has a variety of tools used for most common bike repairs and adjustments, including tire levers, screwdrivers, and hex wrenches. The Bedford Singletrack, like any trail, can be a bit of a challenge to find your way around at first, but once you ride it once or twice, you’ll get the hang of it. I put together this first-timer’s guide on my bike shop’s web site that provides a step-by-step overview of how to follow the trail in the proper direction to take in every section of the singletrack.